They say "Native vote has been the swing vote in both victories and defeats." Native Americans’ growing political influence could have a substantial impact on this year’s midterm elections, especially in North Dakota, where Democratic U.S. Sen. Heidi Heitkamp narrowly won in 2012. This year, Heitkamp is likely to face GOP Rep. Kevin Cramer, who is poised to win the Republican nomination during the state’s upcoming primary on Tuesday. “[Heitkamp’s] 2012 victory was credited at least in part, if not in full, to the Native vote,” said Marci McLean, executive director of Western Native Voice, a nonpartisan group that seeks to promote Native civic engagement. Native American turnout, estimated to range from 8,000 to 10,000 votes, could have made a big difference in electing Heitkamp, who narrowly edged out her Republican opponent Rick Berg by fewer than 3,000 votes. (Susan Walsh/AP) Sen. Heidi Heitkamp talks with reporters on Capitol Hill in Washington, D.C., Jan. 22, 2018. But several Native American voters are disappointed in Heitkamp’s response to the 2016 Dakota Access Pipeline protests led by the Standing Rock Sioux tribe, during which they say Heitkamp did not take a stance. At the time, in response to the protests, Heitkamp issued a press release stating that "any protestors should be able to exercise their First Amendment right lawfully and peacefully, but many of the actions we have seen over the past several weeks are not those of lawful protestors and they pose serious safety concerns to other protestors – especially as the temperatures drop – and law enforcement officers, as well as to children, residents, and workers trying to live their lives in their communities." “Her response was quite a letdown. So I think there will be decreased [Native] turnout in North Dakota this year,” McLean said. Mark Trahant, the editor of Indian Country Today, acknowledged “leftover hard feelings” towards Heitkamp after Standing Rock, but believes that Native voters will still turn out for Heitkamp. “I bet those who vote for her will still do so, but the enthusiasm gap will be substantial,” Trahant said. 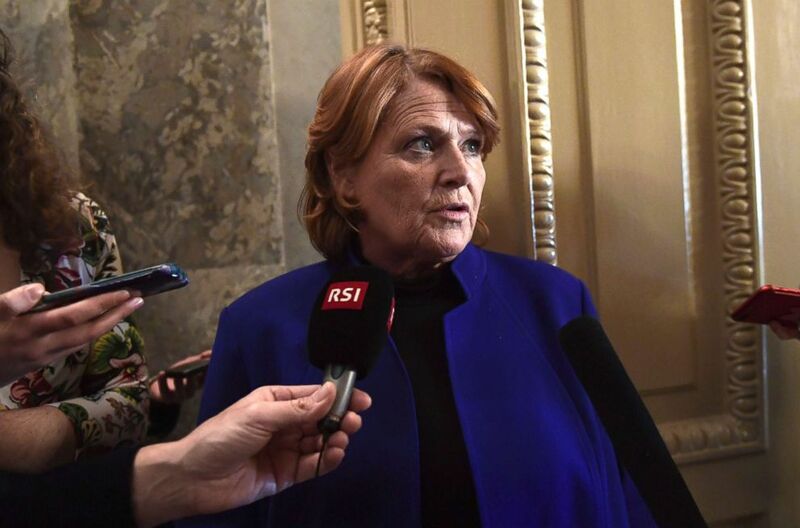 “For her more than 30 years in public service, [Sen. Heitkamp] has been an advocate for Native communities and that continues in the Senate…[she] visited Standing Rock and held a several hour session on addressing the crisis of missing and murdered Native women – which she introduced a bill on last year called Savanna’s Act,” Heitkamp’s office said in response to ABC News’ request for comment on the Standing Rock protests, pointing to Heitkamp's January meeting with tribal members. But some Native voters may stay home on Election Day this year – either voluntarily, or because of a new North Dakota voter ID law that they say disenfranchises Native communities. Native American activists are challenging this law in court, including the Native American Rights Fund (NARF), a group that has been active in promoting Native voting rights through legal assistance and said the law was a form of voter suppression. “In places where Native Americans have low turnout, it’s because of suppressive tactics, not because they’re not interested in voting. It’s important to dispel myths about Native political apathy,” said Natalie Landreth, a senior staff attorney at NARF. “We are trying to increase political power in Native communities and make Native Americans a key voting demographic by ensuring there are enough voting opportunities for them, such as registration and early voting sites,” she said. Heitkamp also acknowledged the barriers to Native American voting rights in a May letter to the Department of Justice. “Native American communities, especially in rural areas, face significant barriers to casting a ballot...time is of the essence to ensure that...proactive measures are taken to protect the voting rights of Native Americans,” she wrote. Ultimately, a district judge ruled against the North Dakota law, citing its negative impact on Native voters. But this victory is just one example of Native Americans’ growing political influence in North Dakota, where Native educator Ruth Buffalo is running for state legislature and is helping Native voters organize through the North Dakota Democrat-Non Partisan League. In fact, there are at least fourteen recognized indigenous tribes living in North Dakota and South Dakota, which held its primary this past Tuesday and will hold state party conventions later this month. At the South Dakota Democratic convention, Tatewin Means is hoping to secure the nomination for attorney general. “She was the first candidate to put out an ad in a Native American language,” Trahant said, pointing to the candidate’s campaign video in Lakota. In South Dakota, NARF is also working to promote voting rights among Native Americans. A survey conducted by NARF revealed there is “almost no trust in local governments by Native American voters in South Dakota; therefore, local governments need to make more of an outreach effort especially on reservations,” NARF wrote in a January report. But the Dakotas represent just the beginning of a growing Native American political mobilization among voters and candidates alike. “A lot of [the organizers] are younger this year, and that’s exciting. Finding those issues that directly connect the U.S. and state governments to our lives on the reservation is what makes us successful,” she said, using the examples of tribal college funding and Medicaid expansion as issues that affect Native communities. “Over 100 [Native] candidates are running for office across the country this year. The Standing Rock protests in the Dakotas were definitely a major part of [mobilization] this year. In fact, Deb Haaland spent time there during the movement,” Trahant said. (Juan Labreche/AP) Deb Haaland, center, speaks with campaign organizers at the Haaland headquarters in Albuquerque, New Mexico, June 5, 2018. 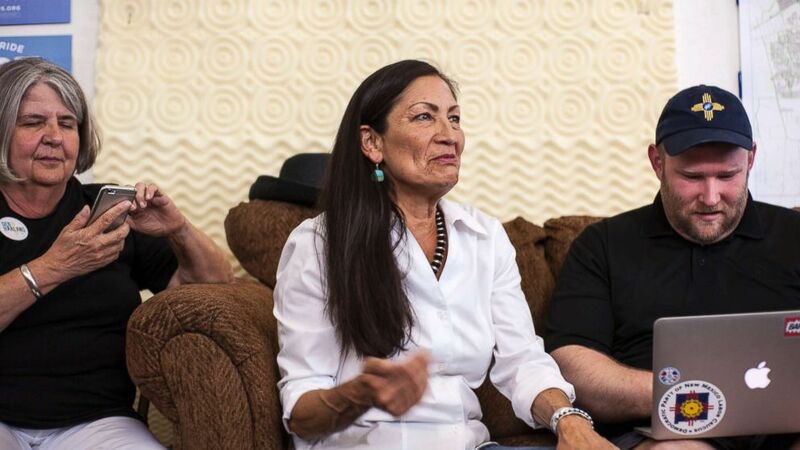 Haaland, a tribal member of Laguna Pueblo, is aiming to become the first Native American woman in Congress. On Tuesday, Haaland won the Democratic nomination for House in New Mexico’s 1st Congressional District, positioning her to likely become the first-ever Native American woman in Congress. Haaland’s victory follows that of Native American legislator Paulette Jordan, who won the Democratic nomination for governor in Idaho last month. In a show of solidarity, Jordan recently traveled to New Mexico to campaign for Haaland. “Deb Haaland and Paulette Jordan are strong Native American women...they are helping to raise the Indigenous voice,” Western Native Voice said. “It’s an extraordinary year. The sheer number of candidates is extraordinary. Women make up 60 percent of [Native] candidates this year,” Trahant, who regularly maintains a spreadsheet of Native Americans running for office, said. 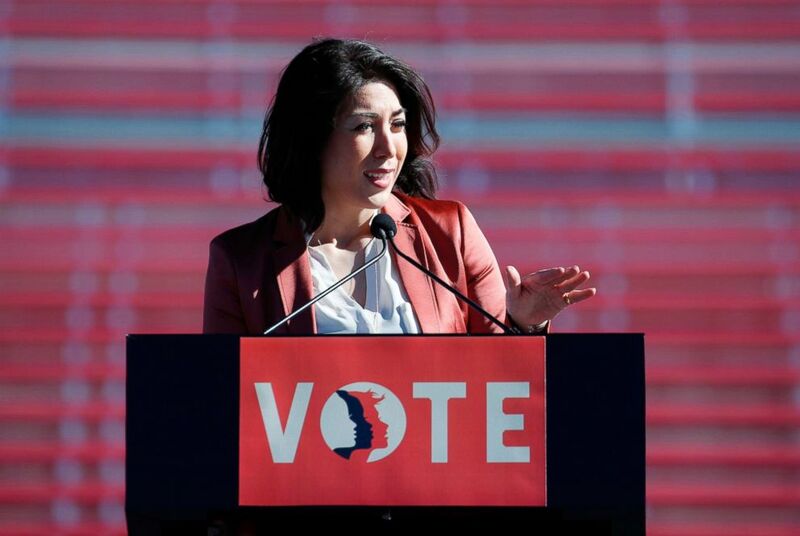 (John Locher/AP) Rep. Paulette Jordan speaks during a women's march rally in Las Vegas, Jan. 21, 2018. “Most are Democrats, a handful are Republicans, but what’s really surprising is the number of independents. There are almost as many independent or third-party candidates as Democrats,” he said. Trahant believes television commercials are the “most significant thing” contributing to growing Native American civic engagement. “What’s really striking is the impact it’s had on young girls,” he said, pointing to video ads such as that of Sharice Davids, a Democratic candidate in Kansas’ 3rd Congressional District. Now a community leader, Davids's resume includes stints as both a lawyer and a professional MMA fighter. “Sharice Davids is redefining what it means to be a Native woman,” Trahant said. While the Kansas primary isn’t until August 7, Tuesday’s primaries include those in North Dakota, Maine, where Native American candidate Henry John Bear is running for Congress as Green Party candidate in the 2nd Congressional District, and Nevada. “The Native vote may be crucial in Nevada, a swing state with a large Native population,” Landreth said. Ultimately, Trahant is confident that Native American civic engagement is here to stay beyond 2018. “We’re going to have some major candidates on the ballot, and that will be significant. It’s going to stir people for a while,” he said. Western Native Voice expressed similar sentiments in its statement.